My husband loves the weekends-he doesn’t have to get up pre-dawn as he does during the week, he gets to relax with a nice cup of coffee or two while reading the news, enjoy a piping hot freshly made breakfast made by yours truly. For me on the other hand-the weekend morning were even more hectic than usual. There are three little guys dead set on not letting me drink my coffee while it’s still hot and on top of that I need to cook a full hot breakfast (I’m Southern-it’s a compulsion to feed my man well!) I was struggling to balance feeding the family with getting some relaxation myself. 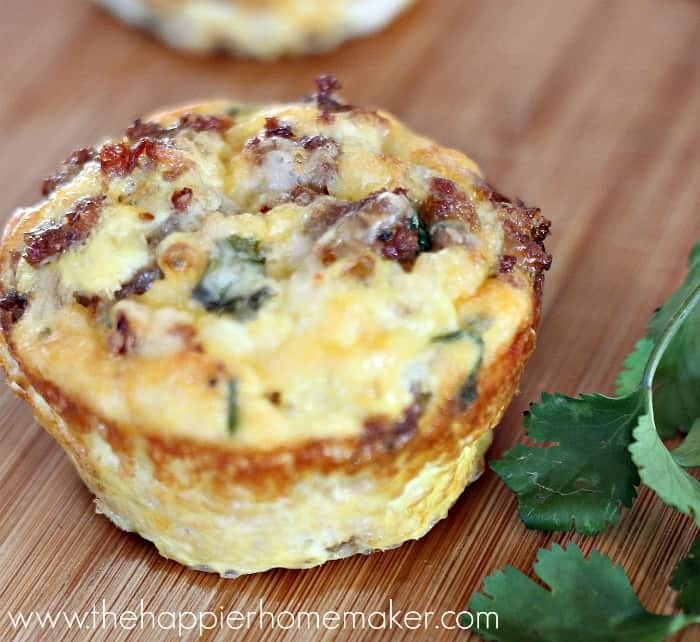 I started to experiment with recipes and found the perfect solution to my dilemma-a egg, sausage, and cheese breakfast muffin (no carbs, yay!) that is even easier than making scrambled eggs! Hurray for hot coffee on the weekends! The key to keeping this recipe super fast and easy is cooking up the sausage beforehand-I try to remember to brown the sausage when cooking dinner Friday evening and popping it into the fridge so I can just add it to the recipe the next morning. Let it warm up up a bit as you preheat the oven to 350. 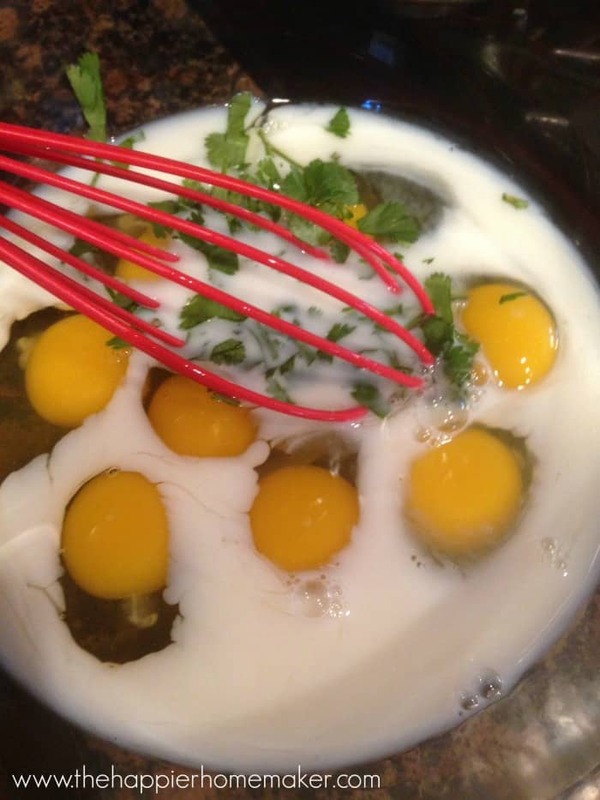 To start, just like scrambled eggs, combine 8 eggs and 1/3 cup of milk and whisk thoroughly. Add 2 tbsp chopped fresh cilantro and 1/3 cup of shredded Jalapeño Havarti. 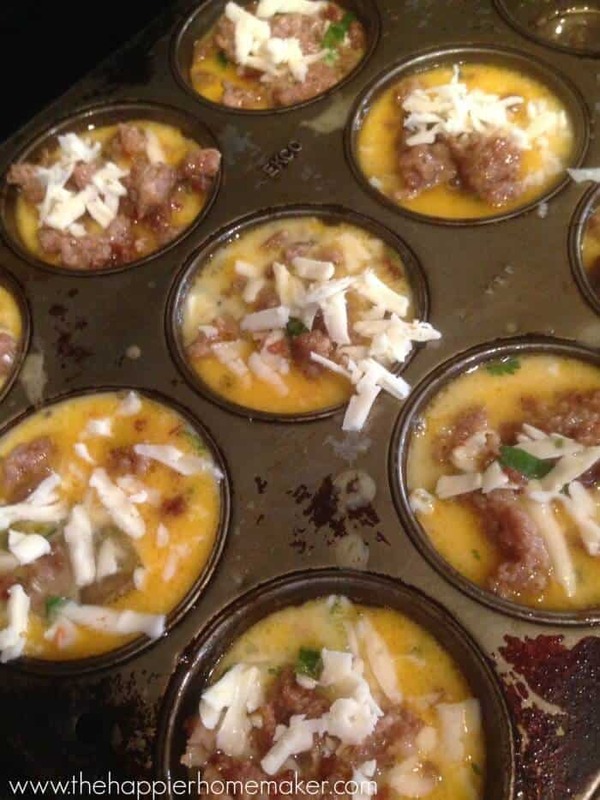 Stir in the sausage and use a ladle to spoon into a muffin pan well sprayed with nonstick spray. (Please excuse my ancient and obviously well-loved muffin pan!) Cook for 30-35 minutes or until golden and fully set. Feel free to enjoy hot coffee and reading the news (or blogs) while it cooks! I love pasta and am always looking for new recipes! This would be great to make for a family dinner! 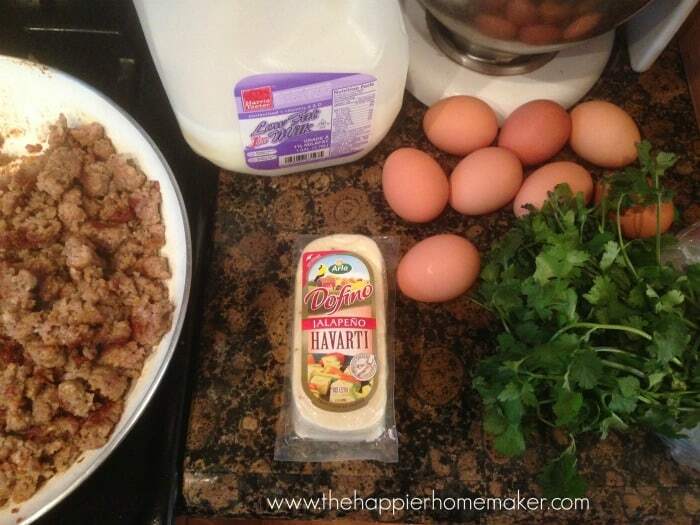 I would love to try the BLT Macaroni and Cheese, sounds so yummy – my family would love it! In the numbered steps recipe, you don’t mention adding the sausage to the mix. Also, I can’t tell from the recipe or the photos whether or not the sausage should be precooked and drained. The milk has carbs, 5 (depending if it’s semi, skimmed it whole) carbs so it isn’t carb free. Thanks for the correction Avril, I’ll call it low carb then! Thank you so much for this recipe! 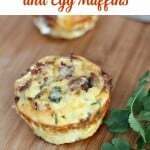 With the new school year starting, I am looking for some great pre-made, low carb, grab n go breakfast options for myself. 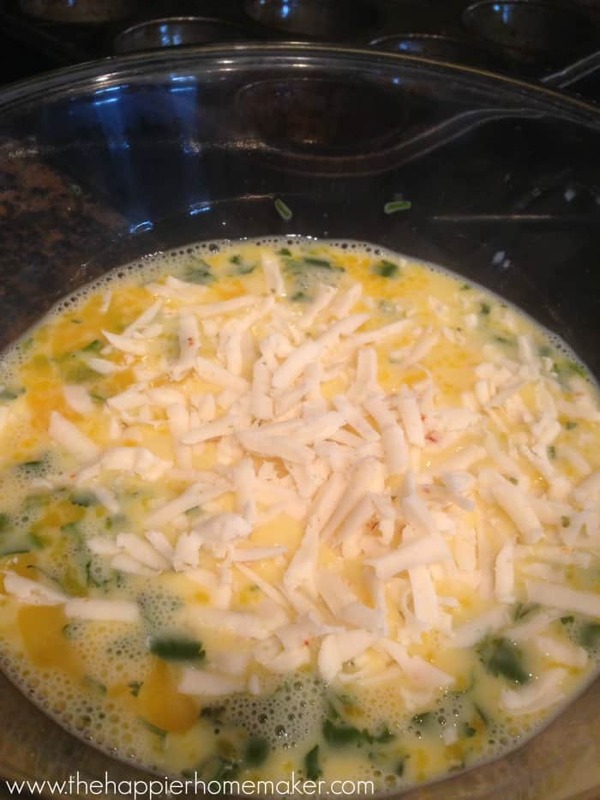 Have you experimented with half n half or heavy cream, instead of milk, to make it even lower carb? Thank you! Yum! We are big fans of Havarti but I have never tried it with jalapeño. I can’t wait to try it. I am always looking for low carb recipes to add to our rotation. 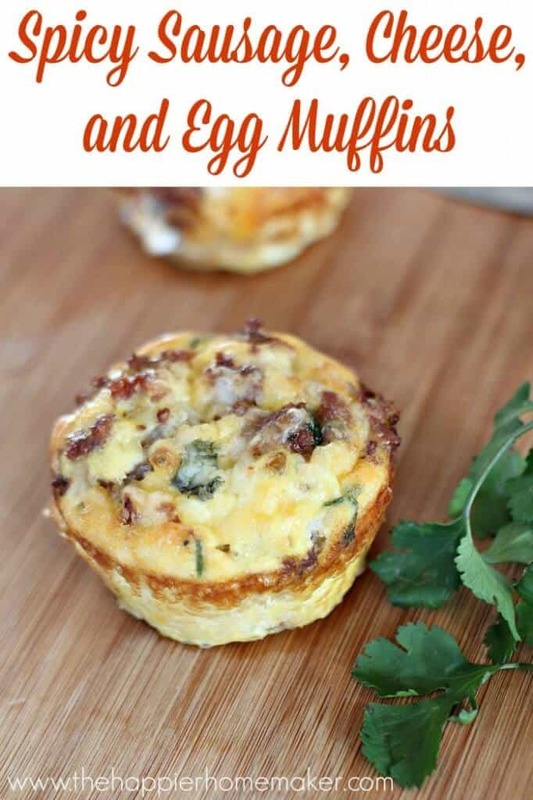 So excited to try this…I’ve been looking for healthy grab and go breakfasts for my boys 5am swim team practices, that they can eat easily after when they are so hungry. I love this idea and think they will too. I am a big fan of egg muffins but not a soo cheese fan. I eat egg muffins every weekend for breakfast. Kids love it too. Nicely explained recipe. Thanks for the share. Glad you enjoyed it Cherry!